If you’re looking for Dudley self storage, your nearest Access branch is at 180 Sherlock Street in Birmingham. 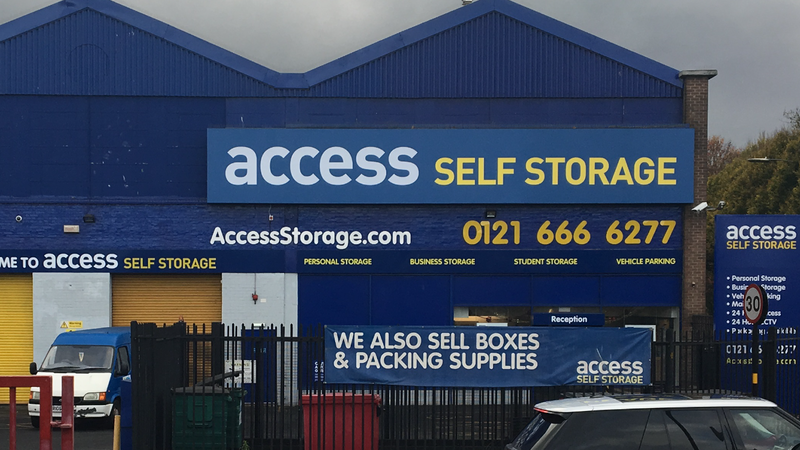 Access Self Storage Dudley is located in Birmingham city centre which has everything a Dudley resident or local business owner looking for self storage could need – and more besides. Our secure units are CCTV-monitored and held within a gated and fenced perimeter. As well as this, the store offers a receipt and despatch facility, forklifting, a covered loading bay, free parking, lockers, and mail box rental. Dudley residents looking for self storage have only a half hour drive ahead of them. Starting from The Broadway, take a right turn onto Tower Street and proceed onto the A4123. From there, change to the A457, then the B4135 and B4126. When you reach the A450, keep going down the left-hand lane until you reach the roundabout, where you’ll take the first exit onto Sherlock Street – the location of Access Self Storage Dudley. Dudley’s 79,000 residents have plenty to occupy themselves with. The famous Dudley Canal provides diversion for those who enjoy relaxing on a narrowboat – perhaps with a fishing rod and a picnic basket – on a sunny long weekend. Of course, once you’ve made your big catch, it’s entirely possible you’ll struggle to find room for your fishing gear; if that’s the case, try Access Self Storage Dudley to avoid cluttering up your house. If you’re of more of a sporting bent, you’re well served by Dudley. While it’s famous for the dubious honour of being the biggest town in the country to never have a national league football team, Dudley Town FC keep the flag flying high in the Southern League – and it’s also home to several sporting legends like Duncan Edwards and ‘Big Sam’ Allardyce. If you’re an aspiring footballer yourself – or simply an avid collector of football memorabilia – consider renting a storage unit near Dudley so your hobby doesn’t get in the way of your home. Dudley isn’t all about leisure, of course: it’s famous as one of the birthplaces of the Industrial Revolution, and it’s still a home to thriving commerce today. Merry Hill Shopping Centre, for example, is part of the local Enterprise Zone and is the fifth biggest retail areas in the country. If you shop regularly at one of its 210 stores – or if you run one yourself – it’s worth considering Access Self Storage Dudley: an entrepreneur will always need somewhere for their stock, or if you’re a regular shopper it may be time for a clear out at home. If you’re interested in storage in other nearby areas, check out our pages on self storage in Erdington and self storage in Selly Oak.